There I've got that out of my system, now for my review. Initial impressions, the cover is nice, it looks fun, light-hearted, girly and feminine. 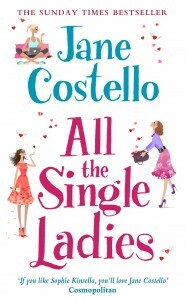 There are three skinny women on the cover throwing love hearts around, there's also a recommendation from Cosmopolitan comparing this book to Sophie Kinsella. All these things made me think that 'All The Single Ladies' would be fun, fashionable and maybe a bit too sickly sweet for me. But no! If this book was a sweet it would be caramel with a hint of sea salt - it's sweet, but not overbearingly so. All in all it was a fantastic read, I turned into a hermit for 48 hours and read as much as I could, whenever I could. Jane Costello is obviously a very talented author and I'll certainly read her other books if I can get hold of any more of them. I really admired her writing style, although she didn't go in for reams of character descriptions and oodles of adjectives - Jane Costello very carefully built up the scenes in the book and the main character's view through detailed, realistic dialogue. I felt as if I was the invisible fourth friend in the group, sat listening in to their conversations as they gossiped and chatted about love, life and lots of things in-between. Every character is given a back story and reads as if they were real. This is a huge strength in this book and the main reason I loved it so much. A plot summary! Samantha Brook's long term boyfried has left her, after having what can be summarised as a 'mid life crisis' She is abolutely heart broken and with the support of her best friends Ellie and Jen, she vows to get him back at any cost. If this means dating other men and parading them in front of him, or looking gorgeous in the places where he's most likely to be, or by pretending she's not heartbroken - then so be it! Samantha throws herself into a full blown plan of action - her man will be hers again! Or will he? There are plot twists and turns you don't quite expect, and a lot of laughs along the way. Within the story there are sub-plots too and it's not all as straightforward as you might think. Yes, this is a romance, no this is not predictable. I can't stand being able to predict what happens in a book, and this kept me guessing right up until the last page. This is Chicklit at its very best. I'll give this a 9/10, I'm only deducting the one point because the book cover is generic and rather typical of this genre which I find a tad boring. But.....this was the only flaw I could find. A great read and one I'd recommend to anyone who loves light hearted romance, rounded characters and above all a good giggle. If you'd like to buy a copy of this book you can find it here for £6.49. Its a keeper!